Old known stuff, probably for everybody who is somehow related to networking, but anyway, putting it here too. If QoS is enabled and you like to prioritize the traffic, flow control needs to be disabled,as it doesn’t care about any higher level prioritization, just when ingress traffic is coming in faster than receiver can accept it, flow control will kick in and send pause frames until the ingress-egress rate will be equalized or ingress rate is lower than egress of that interface. But of course no way of using it on trunk links, other switch facing links and etc. Basically we are creating one logical switch out of two physical switches. From the left we see how it looks when interconnected physically, from right how end device sees it. 1.Enable spanning tree – RSTP and PVST supported – step is optional, but nevertheless recommended. Recommended to have a root bridge on VLT master and to set STP priority to secondary VLT switch in case if the first fails no to have topology change when other third unknown device would become a root. Backup links are needed to have a heartbeat messages flowing between two switches. VLT also would work without the heartbeat but then you can encounter possible split brain scenario in case of VLTi link failure. Now let’s attach a device to our VLT switches. You can tweak the stuff like dampening – just to give some time for routing and other protocols to get online after rebooting the switch ,as ports will get up faster and devices without knowing that routing protocol is not ready yet may black hole the traffic. You can also play with spanning-tree metrics – to have interruption after reboot as small as possible. for all routes to establish adjacency and exchange all the L3 routes between the VLT peers before you enable the VLT ports. Stacking is not allowed when configuring the VLT. on a spanned VLT VLAN. disable the VLT ports if you happen to confgure the unit ID or system MAC address on only one VLT peer at any time. Secondary peer are orphaned and are shut down. Overall VLT is a great thing for load balancing, redundancy and availability (you can upgrade the switches one by one without having a downtime) – In stack this wouldn’t be possible. 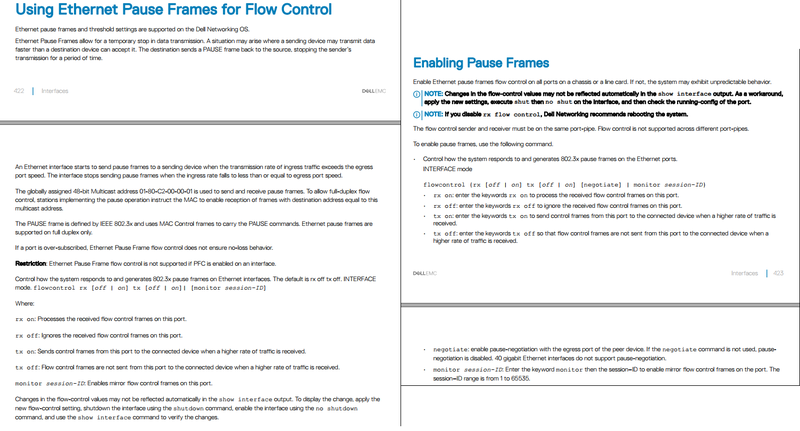 In user guide you can find a lot of detailed info about all the possible switch OS functions and how to use/implement/troubleshoot them. Some important points about VLT Peer routing technology. you can also enable the peer routing feature. In a nutshell, when peer-routing is enabled on both VLT switches you can load-balance, the L3 packets through both switches – as this allows a switch in VLT domain to forward traffic on behalf of its peer switch. Peer-routing helps to avoid sub-optimal routing, reduces the latency by avoiding another hop in traffic path, no need to have VRRP. Keep in mind in case if switch – Peer-1 will fail with peer routing enabled, your traffic will still be forwarded without any interruption – but as you don’t have any virtual IP address any control or management plane requests won’t be answered by Switch-1’s peer. So basically by enabling peer routing we have only one goal – redundancy and traffic sharing for L3 protocols. traffic loop in a VLT domain, take the following steps. 1 Configure RSTP in the core network and on each peer switch as described in Rapid Spanning Tree Protocol (RSTP). Disabling RSTP on one VLT peer may result in a VLT domain failure. 2 Enable RSTP on each peer switch. 3 Configure each peer switch with a unique bridge priority. More info about peer-routing advantages comparing to VRRP. Routed VLT v1.2 – document covers peer-routing in great details.